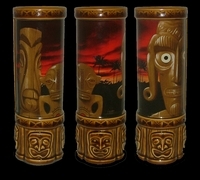 Sunset Tiki Mug BA800R Free Shipping. Sunset Tiki Mug The companion mug to our new Sunrise Tiki mug, our Sunset Tiki mug also features the art of Scott Scheidly and measures 8" in height and has a 14 oz. capacity.